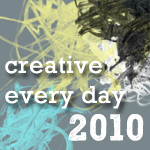 Ways to share: Once you've signed up, you can leave a comment on this post and/or use the "Mr. Linky" widget below to link to a blog post(s) about your creative activities during the days of 12/6/10 - 12/12/10. YES – another week of creativity, here we go! I don’t do any art of my own today but I have a beautiful picture book to inspire you! Nothing to do with air this week, but I’m in the middle of showing (over a couple of weeks) pages of my first handmade book. This week on my blog I am giving away a goody bag full of inspiring items from the Faroe Islands. You are all most welcome to enter – all you have to do is leave a comment telling me about your favorite inspirational place. Come on over and enter to win! I posted images on December 5 and 6. Blue Air and Wonder. Air – I most certainly indeed do have Air! And I don’t want to let go of AEDM, so here I am at CED! With every intention of posting at least once monthly if not more on the prompts. Thanks Leah! oh, wow, Leah – this quote about leaves speaks to my soul. Who is this author? “The leaves lay like hands upon the ground. When the wind rustles them, they applaud softly. ~Laura E. Stevens” I know her name, obviously but who is she in terms of books, etc? She is truly a kindred. I must read whatever she has written! OMG! I spent ALL of yesterday afternoon creating art. I worked on two large pieces and did 4 miniature collages. Stop by to check them out this week. I had spent little time doing art lately and yesterday was such a treat. A wonderful way to start my week. Happy creating! Hi and Happy Monday! I’ve been thinking about air and suddenly it struck me; air is the spaces in the drawing or painting that let the composition breathe and come to life…:)! It’s a thought! Thank goodness for all of you! Happy Monday everyone! I hope you had a great weekend! I spent most of the weekend working on a couple of larger pieces, both of which I started during recent demos where I demonstrated painting techniques in front of a crowd. This weekend I had a captive audience…a line of people at the coffee shop coming in from the parade and the freezing weather…lol. Whatever works, right??? I thought it’d be fun to share photos and ideas about the place where I actually do my creating (well, besides the kitchen). Since AEDM I’ve continued to create daily (although not post daily). I seem a little addicted to my new venture of creating mandalas. I also tried to draw a comic/cartoon type picture which was hugely brave of me to post because I really can’t draw life like things. But I wanted to push myself outside of my comfort zone. I’ve also started to play Christmas carols on piano & recorder…………….oh lots of creative stuff – I’m getting a real healthy buzz from it. Hope you’re enjoying your creative time. I’m addicted to the creative every day bit. So glad I joined in for Nov. cause I’ve kept it going. Anyways, haven’t followed the prompt because I’ve been working on Christmas stuff! Still, can’t wait to go check out what people are coming up with this week. Had the hardest time figuring this out but I seem to have got. I’m sufficiently recovered from NaNoWriMo and AEDM to actually try this. A new year coming up! I’m finding it hard to post every day. Harder than being creative everyday. Well, hey, that’s okay. We’re all just trying to get along, I think. Sliding in at the last minute. I hope some of you will come and see what I have been working on. Comments are appreciated.